Team Zombillies reviewed this attraction on September 16, 2016. 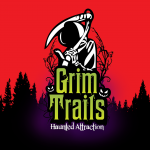 Grim Trails has a full cast of 40 members this year, which is quite a few more than they had last season (25)! During our visit, most of the crew had believable performances which was greatly increased by their utilization of the props and other items in their scenes. They were also rather energetic, running ahead of us, fighting with each other, banging things in their scenes and climbing on things including scaffolds directly above us! The intensity of some of the creatures let us know we weren’t exactly welcome here such as the Cheshire cat who hissed at us while running around on all fours, the intimidating Rabbit who led us down his long, dark tunnel as he huffed at us, the piggy who chased us out of his brick house and, of course, the witches… especially Tituba as she snarlingly came face to face with our group! Some of the characters were a bit more interactive with our group and had threatening dialogue such as Hansel and Gretel, Patches the clown, the Mad Hatter, a troubling girl in the jungle (you might want to bring some bananas) and two of the witches that couldn’t decide whether they were going to boil or burn our group! If you make it through the witches, your trip isn’t over yet, Satan himself has been summoned and “may” be at the end of Salem, waiting for you! We came across some very impressive costumes while visiting Grim Trails this season! It was a bit dark in some areas while we were there, so we aren’t sure if we were able to see all the costumes entirely, but what we could see looked very complete and appropriate for the scenes we saw them in. Makeup, when used, added an extra touch of realism to some of the characters and consisted of crooked smiles, darkened eyes and discolored skin. Many masks were used including some that we’d never seen before (especially Satan’s) that matched all the characters wearing them and helped in bringing them to life! Colored contacts added another dimension of realism to the witches who were wearing them (or was that their real eyes?). A few of the costumes blended in so well with their surroundings that we nearly missed them until they moved, including a ghillie suit and the Great Pumpkin, which was also one of the most memorable costumes we noticed. Other stand-out costumes included Tituba, the witch with cloudy eyes, Kaa, Maleficent, the wolf, the skull-headed girl and the Wraith. A well-lit sign by the road displaying the haunt’s iconic Grim Reaper logo was the first thing we noticed upon arrival, followed by another sign that directed us around the house towards the free parking area. As we neared the lot, we drove underneath the haunt’s official ‘entrance’ that depicted some of their characters as we passed through. At the far end of the parking lot, you will notice lights, more signs, portable restrooms and the ticket booth, so needless to say, this haunt is rather easy to navigate; which is great because, who likes walking around in circles trying to figure out where to go? 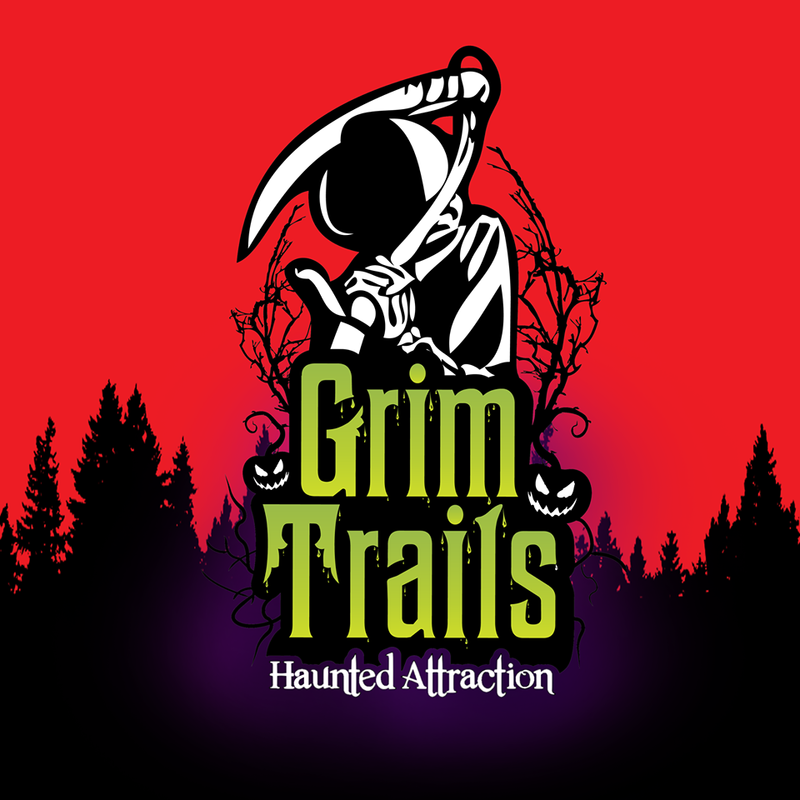 Grim Trails’ staff members were very friendly and pleasant to deal with during our visit and there was a police officer on site for security purposes who was just as friendly as well (although, if you upset him, we’re sure he’ll take care of business)! Drinks, snacks and group photos can be purchased here this season (yes… we said photos!) and the photo op is conveniently placed in the waiting line so that everyone gets a chance to easily get their picture professionally taken. Proofs can be picked up at the ticket booth after exiting the haunt for an additional fee. The waiting line has been separated for Groupon and regular general admission tickets and the fellow directing which line we needed to be in was very enthusiastic and we could tell he was happy to be there (staff who act like robots can be no fun)! We noticed several benches that lined one of the queue lines, which should prove to be a welcomed feature for customers who have to wait for long periods of time. Finally, we noticed a lot of fresh gravel (30 tons) that had been put down throughout the entire trail, which should help with mud and make it less possible to trip over roots. Still be careful because, as of the writing of this review, it hadn’t fully packed down yet, but this should get better with time as more and more customers venture into the darkness! Some areas of the trail were a bit dark, including the first room but we were told new lighting was on its way and was just going through shipping troubles. Once we parked and headed towards the ticket booth, this attraction’s penetrating creepiness started to set in. The ticket cabin, trickling water, bridge and cauldron around it help set the tone for the wooded trail. Appropriate music was being played from the ticket booth that gave us something to listen to as we waited to get our pictures taken. Each year we say it and we will say it again, the walk to get in line at this place is spine-tingling all in itself. Small tea lights in mason jars are placed every so many feet to help light the way while ghastly whispers came from all angles, encapsulating our group. If you are with a louder crowd this may be harder for you to hear but they continue to play all the way to the entrance of the trail so we hope you are able to hear them at some point. As we awaited our turn in line, intriguing sounds emanating from within the darkness increased our anticipation to enter! We noticed several new scenes during our tour of Grim Trails this year and much of what we saw seemed to be well-decorated. A couple of the most notable changes include the new “catacombs” area of Maleficent’s castle, complete with curved, concrete ceilings, and a new two-story building in one of the Salem areas. While some of the areas are detailed extremely well, others lack just a bit in comparison and some portions of the trail are lined with black fabric; although, this is to help guide you along your journey and keep you from seeing into the other parts of the trail. Most (but not all) of the scenes also had relevant soundtracks and strategically-placed accent lights with them that helped create a more immersive and captivating experience. Of course, we can’t exclude the running water, fog and lunging corpses and other “large” critters that are scattered along the trail system, as each of them entail their own unique surprises! Grim Trails has, debatably, one of the most unique themes that our review team has encountered. You’ve heard the stories of “Little Red Riding Hood,” “The Three Little Pigs,” “Alice in Wonderland,” “The Jungle Book” and more, but you haven’t seen them like this! Grim Trails brings the sinister sides of these stories to light, gives them some teeth and wishes you luck as you embark on your whimsical, yet treacherous journey through the dark side of Disney. 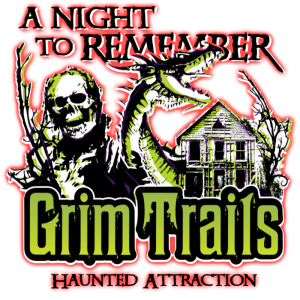 Along with many of the classic fairy tales that you’re familiar with, Grim Trails has added their own twist for 2016 with the Witches of Salem! With several scenes depicting the trickery and mystery of these wicked women, this haunt is continuing to prove that they’ve always got a trick or two of their own up their sleeves. With such a unique theme, frights are formed by a vast variety of villains with a few deriving from special effects here and there as well. Scariness levels ranged from creepy whispers and bickering over whether they were going to “burn [or] boil” us to high-speed chases, beastly growls and monstrous attacks! Other fears that frequented us included loud noises, several giant creatures, well-blended costumes, a slithering strike and an overhead scare just to name a few. With all of the great hiding spots, we weren’t always sure where the next scare was going to come from, so this attraction does well at trying to keep their scares less predictable. 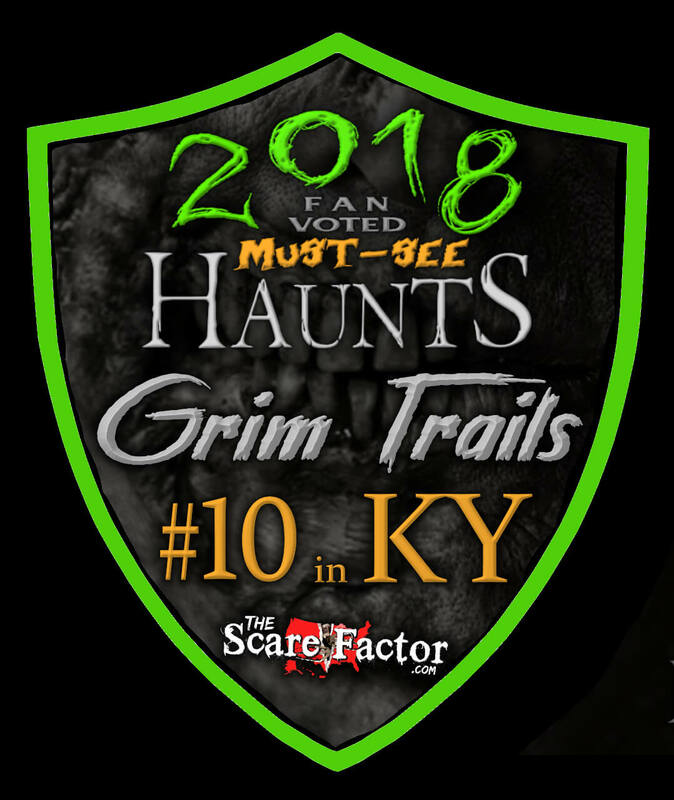 Overall, we’d say that, due to the inherent nature of their theme, Grim Trails’ overall fright level is high enough so the “big kids” can still get some good scares, while still being modest enough not to traumatize the little ones as well. Their cast has been well-trained and we’ve seen them successfully modify their shows to accept both audiences. Along with the new scenes, Grim Trails has also increased their length this season to approximately 23 minutes. Keep in mind that tour times may vary, depending on how fast you walk (or run) through these twisted trails! Ticket prices have risen to $20 (Children under 10 may enter for $10), so that puts them at 1.15 minutes of entertainment per dollar spent (MPD). This is a slight drop from last season but, although our 2015 findings were that “average” is around the 1.5 mark, Grim Trails still has a competitive MPD score for the Louisville area. 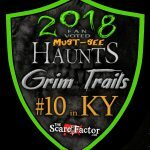 Combined with their one-of-a-kind theme and upgrades for this year, we’ve got no issues with recommending this attraction as a “must see” haunt this year… but don’t take it from us; Grim Trails was voted #15 in our nation-wide “Top 31 Must-See Haunts List” for 2016 by their fans!